This tutorial presents an overview of the core JAX-RS concepts, important annotations, and JAX-RS Jersey implementation. JAX-RS is Java API for RESTful Web Services (JAX-RS) is a Java programming language API spec that provides support in creating web services according to the Representational State Transfer (REST) architectural pattern. If you are not familiar with RESTful concepts then you can first learn about RESTful API on RESTFul Tutorial. Once you understand the RESTFul concepts then it's easy to understand the core concepts of JAX-RS. Once we will learn above topics then we will learn JAX-RS Jersey Framework. Root resource classes are POJOs (Plain Old Java Objects) that are annotated with @Path have at least one method annotated with @Path or a resource method designator annotation such as @GET, @PUT, @POST, @DELETE. Resource methods are methods of a resource class annotated with a resource method designator (resource method designator annotation such as @GET, @PUT, @POST, @DELETE). Example: A sample code example is a very simple example of a root resource class using JAX-RS annotations. The @Path annotation's value is a relative URI path. In the example above, the Java class will be hosted at the URI path /helloworld. This is an extremely simple use of the @Path annotation. What makes JAX-RS so useful is that you can embed variables in the URIs. In this type of example, the username variable will only match usernames that begin with one upper or lower case letter and zero or more alphanumeric characters and the underscore character. If a username does not match that a 404 (Not Found) response will occur. A @Path value may or may not begin with a '/', it makes no difference. Likewise, by default, a @Path value may or may not end in a '/', it makes no difference, and thus request URLs that end or do not end in a '/' will both be matched. Methods annotation with the @GET annotation respond to HTTP get requests. @GET annotation used for getting operations. Example: get all the books from the database. Note that the GenericEntity wrapper is used to maintain the generic type of the List as Book. Methods annotated @POST respond to POST method requests. The POST HTTP method is commonly used to create a resource. This example code persists the new book object in the database. The @PUT annotation is used for updating a record and method annotated this way respond to an HTTP PUT request. Methods annotated @DELETE are expected to delete a resource. Usually, the resource or its id is passed to the resource method parameter from the URI variable as you can see in this example. Methods annotated with @OPTIONS respond to HTTP Option requests. The options method is used as a request when the client wishes to make a complex HTTP request to a different domain. It is done in order to determine if the client is allowed to make the request or not. The HTTP @HEAD method is identical to HTTP GET method except that the server mustn’t respond with a body in the response. The@Produces annotation is used to specify the MIME media types of representations a resource can produce and send back to the client. @Produces can be applied at both the class and method levels. Example: In this example, the Java method will produce representations identified by the MIME media type "text/plain". The doGetAsPlainText method defaults to the MIME type of the @Produces annotation at the class level. The doGetAsHtml method's@Produces annotation overrides the class-level @Producessetting, and specifies that the method can produce HTML rather than plain text. More than one media type may be declared in the same @Produces declaration, for example: Using multiple output MIME types. The doGetAsXmlOrJson method will get invoked if either of the media types "application/xml" and "application/json" are acceptable. If both are equally acceptable then the former will be chosen because it occurs first. In the above sample, if client accepts both "application/xml" and "application/json" (equally), then a server always sends "application/json", since "application/xml" has a lower quality factor. In this example, the Java method will consume representations identified by the MIME media type "text/plain". Notice that the resource method returns void. This means no representation is returned and response with a status code of 204 (No Content) will be returned to the client. @Consumes can be applied at both the class and the method levels and more than one media type may be declared in the same @Consumes declaration. A query parameter is the value associated with the key/value pair appended to a URL after the ?symbol. So for example, in the URL : http://localhost:8080/api/books/search?keyword=Java&limit=10 the query parameters are keyword and limit and the query values are Java and 10. To retrieve these values use the @QueryParam annotation and pass the name of the query parameter as a value to the annotation, then annotated a method parameter in the resource method that responds to a request to the URI resource /books/search. In the code snippet above the value of the keyword query parameter is assigned to the method parameter keyword and the value of the limit query parameter is assigned to the limit method parameter. On other words, You may need to read parameters sent in a POST HTTP requests directly from the body, rather than serializing it to an object. This can be done by using the @FormParam annotation. The annotation @MatricParam is used to retrieve the parameter value from the URI and assign it to a method parameter. The `@CookieParam` annotation allows you to inject directly into your resource method cookies sent by the client. Imagine you have sent a cookie called cartId to the clients so that you can track the customer’s shopping cart. To pull the cookie from the HTTP request just annotate the method parameter to which you want the cookie data to be assigned. The @HeaderParam annotation is used to inject HTTP request header values into resource method parameters. You can think of it like a shortcut to using the @Context annotation to inject theHttpServletRequest or HttpHeaders instance. Providers are used to extend and customize JAX-RS by altering the behavior of the runtime to achieve a set of goals. Entity Providers This type of provider controls the mapping of data representations, such as JSON and XML, to their object equivalents Context Providers This type of provider controls the context that resources can access with the @Context annotation Exception Providers This type of provider controls the mapping of Java exceptions to a JAX-RS Response instance. The only thing they have in common is that they must be identified by the @Provider annotation and follow the correct rules for constructor declaration. where webcontext is the name of your application. @Path may be used on classes and such classes are referred to as root resource classes. @Pathmay also be used on methods of root resource classes. This enables common functionality for a number of resources to be grouped together and potentially reused. When deploying a JAX-RS application using servlet then ServletConfig, ServletContext, HttpServletRequest, and HttpServletResponse are available using @Context. Resource operations can be performed by using HTTP methods (GET, POST, PUT, DELETE). In ROA, HTTP methods are called as “Unified interface”. It implies that HTTP methods can be executed for all the resources published on the Web and that the meaning of HTTP method does not change with each resource. The association of resource operations assigned to HTTP methods and the post-conditions ensured by each operation is explained below. Server assigns the URI for a created resource, this assigned URI is set to Location header of response and is returned to a client. Resource is created or updated. Meta information of a resource is fetched. Same process as GET is performed and responds with a header only. Responds with a list of HTTP methods that can be used for resources. So far we have learned core JAX-RS concepts such as Resources, Sub-resources, Http methods, useful annotations etc right. 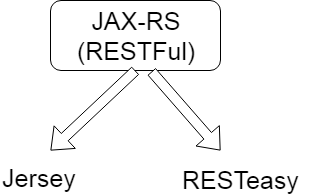 Let's learn JAX-RS implementation using Jersey Rest framework on Jersey Rest Developer Guide. Let's us know if you have any suggestions or feedback about this tutorial in a comment section. Happy Learning and Keep Coding !!! !